"I think this is a song of hope", said Robert Plant as the band Led Zeppelin started playing Stairway to Heaven on that historical night of theirs at New York's Madison Square Garden. That performance has been recorded for prosperity under the live album The Songs Remains the Same. The reason why I am mentioning all of the above here is that I think The Gulf, with all the social issues it is documenting and all the sadness in it, is a book of hope. Told through the eyes of 16 year old Skye, Anna Spargo-Ryan's second book (after The Paper House) takes place at South Australia. Skye lives at a rental apartment in Adelaide together with her single mother and 10 year old brother Ben (I'm pretty sure Ben Ten had a factor in this); her father had long disappeared. Clearly, they are not among the financially better off, and clearly her mother does not enjoy her position in the world. Two things happen to break the idyll. First, the mother brings Jason home, a guy she met at a Big W queue and quickly develops a relationship with. And second, the family is thrown out of their apartment when its owner sells it. The solution to the family's immediate problem? Move over to Jason's rundown house at the remote rural town of Port Flinders. Let us just say that things don't go too smoothly with this move and all. 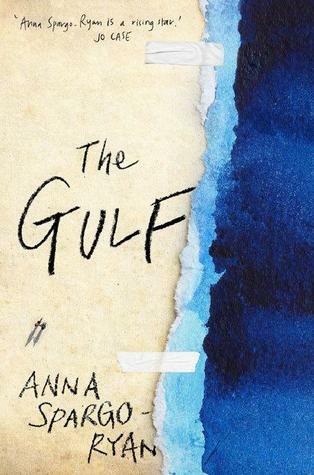 The Gulf is an ode to all those people on the other side of the social divide, the people we generally tend not to devote much thought to. These are the people who live in rural Australia, for whom opportunities are much harder to come by (I will add that the setting receives similar treatment in Australian Rules, a movie that depicts the emptiness of life in rural Australia; that film deals with white to aboriginal relationships, though). These are also Australia's rental class people, the people for whom owning a house they could call home in Australia is no longer an option. It is about single mothers, whom the social welfare system in Australia discriminates against (with the Liberal government doing its best to make life even harder); they are often trapped in a vicious circle between being able to work and being able to afford care for their children. It is about sexual abuse. It is about gender discrimination and the fact that most women still live in a world that has them exposed to predatory males. And it is about the victims of bullying. Even if you, dear reader, are at a privileged position where none of the above classifications are relevant to you, Spargo-Ryan will politely point out that is ever so easy to find yourself there; not that much needs to happen, really. As with Spargo-Ryan's previous book, the beauty here is in the level of detail that renders the experience so vivid. It made Ben, to name but one example, one of my all time favourite fictional characters; I could see so much of his naive intellect in children that I know in real life. There is beauty and impact in that level of detail, and what starts feeling like a teenager's diary turns into a book that read, to me, like a thriller. It is not that often that a book was able to put me so clearly inside a teenager's mind, let alone a female teenager. At the personal level, I happened to be reading this book while listening to the music of Phillip Glass. I have grown to associate that minimalist classical music inseparable to this book, with its dramatic ups and downs providing the perfect soundtrack to The Gulf. I know this is pure coincidence, but it did contribute a lot to my enjoyment from both book and music. To which I will also add that the very fact The Gulf lends itself so well to Glass' superb music is further testimony to its qualities. Overall: Brimming with authenticity, I qualify The Gulf as a true work of art, a book that captures a significant portion of the Australian experience oh so very well. 4.5 out of 5 crabs (and yes, the book does feature crabs! ).